Parents always care about the health of their children. Since flatfeet could cause multiple problems such as growing pain or scoliosis, early detection and treatments of foot problems are recommended. Flatfeet is a common phenomenon among children. Flatfoot is usually divided into two groups, depended on the causes of it: Pathological flatfoot or physiological flatfoot. Pathological flatfoot means that the flatfoot is caused by structural problems (such as tarsal coalition, where two bones are joined together), arthritic change of the joints or dysfunction of some muscles (usually the tibialis posterior). On the other hand, physiological flatfoot is caused by genetic variation or some other non-pathogenic risk factors (such as over-weight). There is a misconception that physiological flatfoot does not cause foot problems or symptoms. This is wrong because “physiological” only describes the causes but not the outcomes of the flatfoot. Physiological flatfoot does affect the biomechanics of the body and causes different injuries. In addition, the term "flatfoot" is often confused. The most popular definition of flatfoot is the lost of foot arches. However, this is not accurate enough as the soft tissues underneath the foot arches may vary in different conditions. A better description is the degree of foot pronation. Physiological flatfoot is an expression of excessive foot pronation. By measuring the degree of pronation, one could define the severity of the “flatfoot” regardless of the soft tissues under the arches. These muscles help to prevent pronation on the foot and maintain good alignment. Specific exercises such as tip-toeing or toe-griping, or general exercises like swimming or running can increase the muscles strength and reduce this risk factor. Overweight is another risk factor of excessive foot pronation. Children aged between two to seven normally have obvious knocked knee (Genu Valgum). It reduces gradually by normal growth. However, overweight could hinder the normal reduction of knocked knee. This deviated knee alignment places excessive loading on the inner side of the foot, and thus directly loads up the foot arch and causes excessive foot pronation. The range of dorsiflexion (bend upward) of the ankle is important in human gait. If the calf muscles are too tight, it reduces the range of dorsiflexion in the late stance phase in the gait. Foot pronation thus occurs as a compensatory response to facilitate the gait. Stretching of calf muscles in daily basis is useful to reduce this risk factor. Parents always seek for shoes in exceptionally light-weighted and flexible because they look more comfortable. However, it is only true for the babies who are still learning how to walk. For the growing kids that are relatively mature (usually aged above 3), the shoes should be structurally good at three points. These features provide good foundation to the normal growth of the foot. Human are born to walk and run on barefoot. Some researchers have stated that unshod children in developing countries have less foot problems than the shod children in developed countries. If we are allowed to walk or run on natural soil or on the beach, unshod is a better idea. However, the urban road surface is challenging for our barefoot, so it is still better to weight protection more than freedom. It usually happens on growing kids, especially on active young boy. The most common painful sites are the protruded bones just below the knees (tibial tuberosity) and the rear part of the heels. The pain could wake up the children (and their parents) as it usually fires at night. It associates with physical activities. Physiological flatfoot plays a role as the muscles attaching to the affected sites are stressed because of the improper biomechanics induced by the pronation. 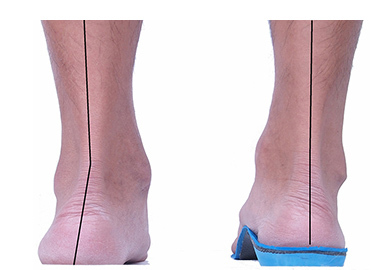 With the correction by the Biomechanics Insoles, growing pain could be reduced. Mild leg length inequality is common in children as the growth may not be symmetric at the same period of time. The shorter side stresses the body and stimulates the growth and it will eventually become balance. Asymmetric foot pronation could also induce leg length inequality as the higher the degree of pronation, the lower the joints drop towards the ground. These can be eliminated by the Biomechanics Insoles that support the foot to their neutral positions. Unless the leg lengths are so much different that cause serious outcome such as moderate to severe scoliosis, heel raise on the shorter side is not recommended as it may suppress the growth stimulation and affect the normal growth of the shorter side. The Biomechanics Insoles is custom-made from the actual shape of your foot by capturing the natural corrected shape from plaster casting. Biomechanics assessment has to be done to evaluate the amount of correction provided by the insoles, the materials used and the essential components added to maximize the functions of the insoles. The Biomechanics Insoles helps to stabilize the feet and control excessive movements of the lower limbs, thus improving the body alignment, minimizing the chances of injuries and enhance your sport performance.